This version of cheesecake is easy and has been lightened up to be a bit more healthy. 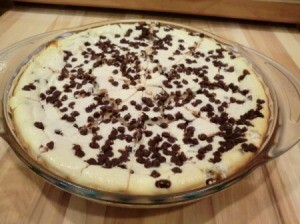 This guide contains a recipe for chocolate chip cheesecake. I love cheesecake, but don't really like the guilt that comes with eating it! I found this Weight Watchers recipe. It was easy to make and really yummy. Preheat oven to 325 degrees F. Lightly spray a 9-inch springform pan with cooking spray. Crush cookies and sprinkle evenly over bottom of pan. In a large bowl, beat together cream cheeses on lowest speed until well-blended. In a food processor or blender, purée cottage cheese until smooth. Add cottage cheese and almond extract to cream cheese mixture; beat until smooth. Add egg whites; beat until well-blended. Stir in 1/2 cup chocolate chips. Pour mixture into prepared pan and sprinkle with remaining chocolate chips. Bake until cheesecake puffs and center is almost set, about 60 minutes. Transfer to a wire rack and cool completely. Run a knife around sides of pan to loosen; release pan sides. Cover and chill overnight. Cut into 12 slices and serve. Yields 1 slice per serving. WW Points: 6 per serving. Note: I did not have a springform pan so I used a glass pie pan. It worked just fine.